Thanks to the foresight of the Save-the-Redwoods League in 1921, today (June 2005) we were able to enjoy and now share the magnificant old-growth Coast Redwood forests that are now known collectively as Humboldt Redwoods State Park in this part of Northern California, which the USDA declared the most scenic rural county in the United States. Humbled State Park would have also been a good name because humbled is how one feels, walking and cycling among the beautiful majestic trees that seem prehistoric. They are the tallest trees in the world. 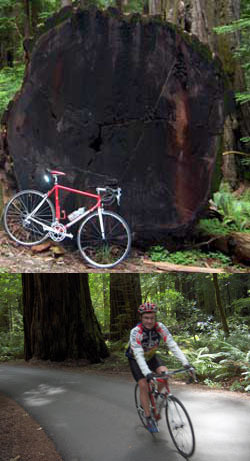 We only rode the south side of the Lost Coast Classic Century from the Valley of the Giants to Petrolia, so a complete ride report for the entire Lost Coast Century will have to be filed at a later date. Of course, not everyone wants to cycle 100 miles and we have lots to share so I felt a mid-term report should be made with part two to follow some other time. 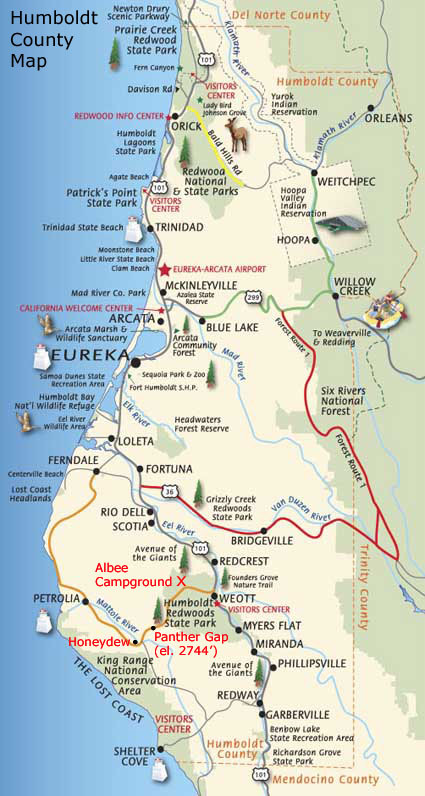 We started our day driving up from Berkeley on US-101, exiting the highway about 6 miles past Garberville on CA-254 otherwise known as "The Avenue of the Giants". 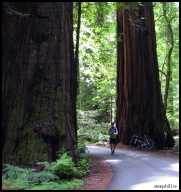 We followed the road for 18 miles through old-growth Coast Redwoods into the park and stopped at the Park HQ/Visitor's Center just south of Weott. Large packs of Harley-Davidson motorcycles roared past and we soon discovered we have arrived on "Harley Run" weekend - a gathering of bikers from all over the nation. Lucky us! We studied the camping information available and quickly determined that the Albee Creek Campground would be the best (and it was) up in the hills away from motorcycles and RVs. Tent camping is excellent under the right conditions and we had excellent conditions for our two nights at the Albee Creek Campground. The campground property once belonged to 1800's homesteader John Albee who must have chosen his property for the blend of Redwood trees, intersecting creeks and the large meadow. Most of the campsites are nestled underneath large redwoods; however we chose campsite #20 under smaller trees and next to the meadow at the end of the campground loop, which meant we'd have only one neighbor. It was a large and flat site which was important for pitching two tents. We hadn't reserved in advance and the grounds looked half-filled when we arrived mid-afternoon on Friday, but it was full both nights we were there (Saturday and Sunday) with mostly car campers planning to mountain bike and hike the many trails. The hiking was awe-inspiring with quiet trails through much of the forest near the campground. Only hiking (and some horseback riding) is allowed in the more precious old-growth areas such as Rockefeller Forest. Cool nights (hi-40s/low-50s) and warm days made the experience even better. 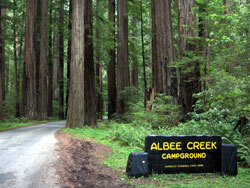 We highly recommend Albee Creek Campground. Read about it in Best in Tent Camping Northern California. After pitching our tents and going for a dog walk, we put Ed in his tent* and started east on Mattole Rd through the park along the road we just drove up with a short side trip to "Big Tree Area" near the campground for some photo-ops. 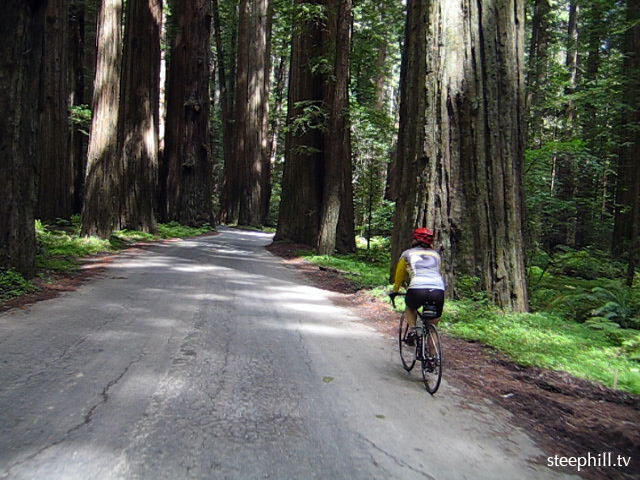 We then cycled down to the Avenue of Giants and headed north away from the motorcycle congregation until the road re-connected with US-101 near Pepperwood. It was quiet but unspectacular. We then returned along the same route for 16x2 miles of riding. Rebecca headed back to the campground while I continued past it and up to Panther Gap (el. 2744') to do some recon for the next day's ride. It was a steady, easy climb and was it was completely uneventful until the return descent at dusk, as I almost spun out while braking hard to avoid a black bear. (see picture below). I then won the five minute staring contest before proceeding back to the campsite. The next day we cycled up to Panther Gap and down the steeper west side and enjoyed great views of the valley, hills and river below as we descended into the tiny town of Honeydew (el. 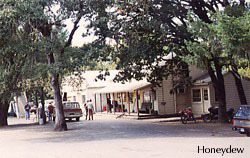 350') consisting of a lone variety store at the crossroads of Wilder Ridge Rd and Mattole Rd on the Mattole River. It was a very peaceful, beautiful rural setting. We then continued along Mattole Rd (north) as it flatten out following it's namesake river before we turned around just short of Petrolia. No Lost Coast for us on this day... our rides are much shorter when we have a dog at the campsite eagerly awaiting our return. While re-crossing the bridge at Honeydew, a local motorcyclist asked us whether we were going to climb the much steeper west side of Panther Gap. When we affirmed "yes", he exclaimed "You guys are in for it! ", and offered to ferry us to the top. It was steep but that's what we seek. Afterall, we don't call this steephill TV for nothing! It's 10 miles from Honeydew to Panther Gap but most of the 2400' of climbing occurs in the first 5.5 miles to Windy Nip Gap (el. 2337') which works out to an average grade of 7%. Nice! The total ride was 50 quiet miles with a double Panther Gap sandwiched between flat sections in warm weather. For the second night in row we had Annie's "certified organic" Mild Mexican Mac & Cheese which doesn't seem like a great way to end the day, but it always makes for a good, simple, effective camping dinner. The next day, after our traditional Sunday morning blueberry pancakes, we broke camp and hiked for an hour through Big Tree Area before driving north to Redwood National Park and on to Oregon. 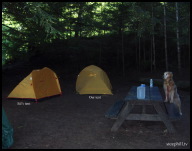 * Leaving a dog unattended at a campsite is no-no, but if the area seems safe, and we pitch his tent in a cool spot, we do it anyway. Sometimes we'll tell the ranger when we arrive and they don't seem to mind.